Sir Terry Pratchett OBE (Terence David John Pratchett; 28 April 1948 – 12 March 2015) was an English author. He was known for his fantasy works, including the famous Discworld series. His first novel, The Carpet People, was published in 1971. He was the UK's best-selling author of the 1990s. He was born in Beaconsfield, Buckinghamshire, England. 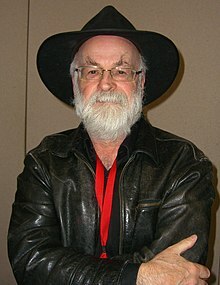 Pratchett died at his home in Broad Chalke, Wiltshire, England on 12 March 2015 from a severe chest infection with final complications from his Alzheimers, aged 66. This page was last changed on 1 April 2018, at 23:20.